If you’ve lost your Toyota car keys, are in need of a replacement Toyota key, or need your faulty car key fixed, Car Key Assist can help. Lost Your Toyota Car Key and Need A Replacement or Spare? We can supply, cut and program keys for a wide range of Toyota vehicles - including key remotes and smart remote for models including Avensis, Aygo, Corolla Verso, Hi-Ace, Hilux, Land Cruiser, MR2, Prius, Rav4, Urban Cruiser, Verso, Yaris and Proace. 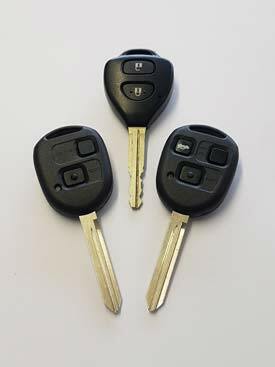 Our expert car key cutting and replacement services are available 24 hours a day, 7 days. Car Key Assist can be there when you need us, providing roadside assistance or at your home address or place of work. As well as replacement keys and remote controls, we can also open locked Toyota vehicles, change lock combinations and remove broken keys from ignitions and door locks. If your Toyota car key has been lost or stolen, we can delete it from the vehicle quickly, to make sure they can never been used again and then provide you with a replacement key. All of our team are trained to the highest standard to provide the best possible vehicle locksmith service - available across the Midlands, Shropshire, Staffordshire, Herefordshire, Worcestershire and Warwickshire.